Continuing on with an astronomical theme this month, in celebration of the planetary alignment, I bring to you another list involving the Solar System. This list is entirely my opinion. I studied astronomy in university, and my main interest was in planetary sciences. We have made some incredible discoveries over the past few years with numerous space probes visiting several worlds in our Solar System. New Horizons was an amazing success at Pluto, Cassini has provided incredible information from Saturn, Dawn brought us wonderful images and information from Vesta and Ceres, and the small army of probes at Mars continue to surprise us. But there’s still so much more to discover. This is what I would like to see in the future in terms of space probes. 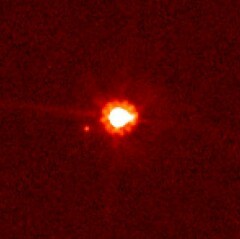 With the success of New Horizons at Pluto, the next largest unexplored world in the Solar System is the dwarf planet Eris. It’s more massive than Pluto, but slightly smaller. With a higher density, what does that mean? Why is a world so much farther from the Sun than Pluto denser? Studying this world could help us understand more about the evolution of the Solar System. It’s completely unknown what Eris may look like, but we can take educated guesses. Pluto completely surprised us, and I suspect that Eris will, too. Unfortunately, it may take around thirty years for a probe to reach Eris, so I’d wait on this until we have better propulsion technology. You’re probably wondering why I would recommend Pluto so soon after the New Horizons mission. Well, Pluto has turned out to be such an intriguing world, one that is active and unique. It and Charon form a remarkable pair of worlds that need to be studied more. With such a variety of landscapes on one side of each world, what surprises do the other sides have? 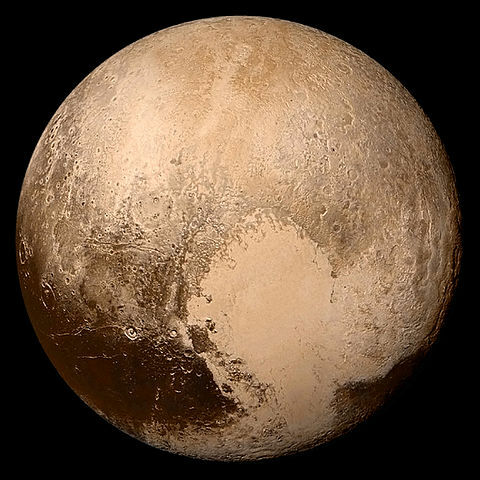 The possibility of a subsurface water ocean means that Pluto has a chance at supporting life. It appears there may be cryovolcanoes that were active relatively recently, as well. The difficulty with this mission is inserting the probe into orbit. Pluto has such a small mass that the probe can’t be traveling at such a high speed when it approaches the world. Venus has been landed on before by the Soviet Venera series of probes, but they only lasted a few minutes to a bit over an hour due to the hot, acidic, and dense atmosphere. A robust lander would need to be developed, preferably a rover. 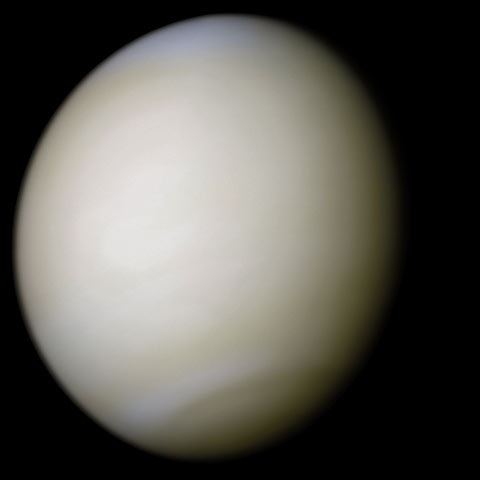 Venus is described as Earth’s failed twin. It had a runaway greenhouse effect that made the surface uninhabitable. 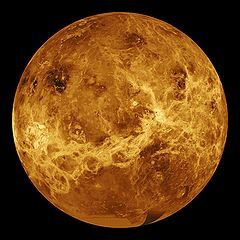 While Magellan has mapped the surface and discovered many Earth-like features, a surface probe may help to answer many questions, such as whether Venus is still geologically active, whether volcanoes still erupt, and so on. It would be fascinating to study the geology of the world. Both NASA and Russia have proposals for landers on Venus. It’s been thirty years since Uranus was visited by Voyager 2. The sideways ice giant has only been flown by, so no intense study of the world and its moons has been conducted. Uranus is intriguing because of its nearly ninety degree tilt to the plane of the Solar System. We haven’t been able to study an ice giant up close, and Uranus is the closer of the two. It has an interesting group of moons, as well, four of which are larger and appear to feature scarps and canyons. But Miranda has my interest, as it seems to be a small moon that has been broken apart and reassembled. It has a huge cliff, as well. I want to see more of this moon. 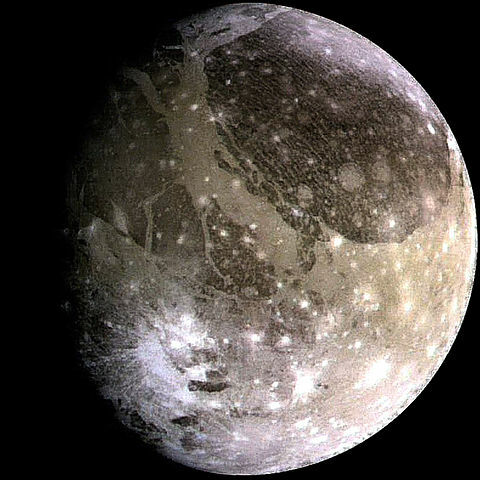 Ganymede is the largest moon in the Solar System, and has the attention of scientists because of its likely subsurface ocean. Larger than Mercury, its surface is a mishmash of various features, including craters and grooved terrain. 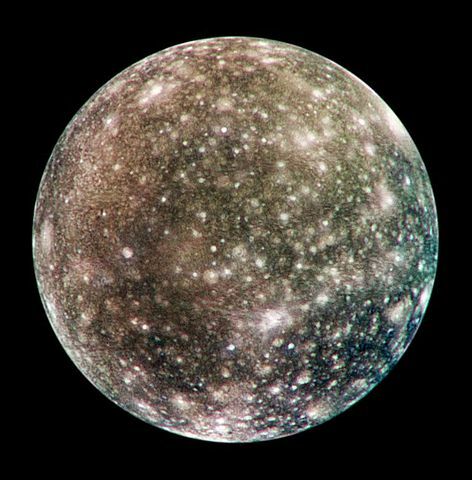 Galileo studied Ganymede when it was at Jupiter, but a closer look would be warranted. I’d like to suggest a surface lander or rover, but an orbiter may be better. The ice crust is so thick that it’s unlikely that the ocean could be examined from the surface. And besides, the surface of Ganymede is quite old. Thankfully, both may be coming true! ESA’s Jupiter Icy Moon Explorer (JUICE) will be launched in 2022, and will orbit Ganymede, while a Russian proposal to land on Ganymede could be launched in 2024. Venus appears twice in this list for a very good reason. While the surface needs to be explored, so does the upper atmosphere. The temperature, air pressure, and chemical composition of this layer of the planet may be able to support life. That alone makes Venus’ atmosphere a very good destination. Already, there’s a NASA proposal called VAMP (Venus Atmospheric Maneuverable Platform) that would be an inflatable aircraft driven by propellers. I guess NASA is already thinking about this. With the Cassini/Huygens pair being successful, why not at Neptune? 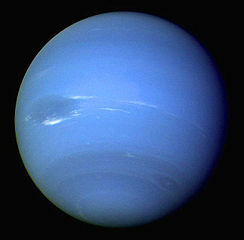 Neptune is the other ice giant planet, and eighth in the Solar System. It has its own large collection of moons, dynamic atmosphere with large storms, and ring system. I’d like to see an orbiter for the planet that explores it and its moons, while a lander is deployed to the surface of Triton. Triton is very interesting and active. It has geysers, a thin nitrogen atmosphere, and possible subsurface ocean. That needs to be checked out. This little world has proven to be a complete surprise. Although small, it is active due to tidal interactions with Saturn. At the southern pole of the moon, there are ‘tiger stripes,’ which have geysers that have been observed venting water vapour into space and back to the surface as a kind of snow. 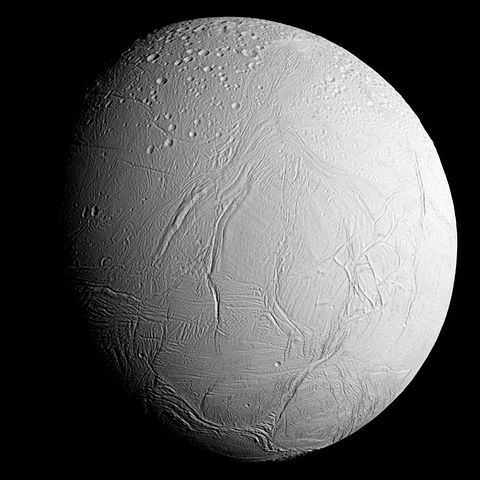 Further study has shown that Enceladus has a global subsurface ocean of water, which makes this tiny world a very important place to look for life. An orbiter might be difficult with its low gravity, but a surface probe sent to the southern region would be very interesting. Both NASA and ESA are considering missions to Enceladus that would ultimately involve Titan. Titan is a high priority for further studies, in my opinion. It’s so Earth-like in appearance and is the only other world in the Solar System with long-term surface liquids. A lander, preferably a rover, could examine the icy surface, possibly near the seas or riverbeds. A flier would fly through the thick atmosphere observing the land below it and sampling the air. It would be nice if both could be done in the same mission, though unlikely. It’s also a candidate for the study of possible life. There are proposals under consideration by both NASA and ESA for landers, balloons, airplanes, boats, and even a submarine. This is an obvious choice. 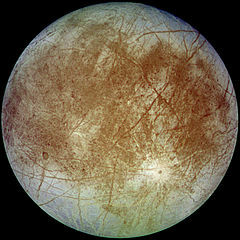 Europa has the greatest chance of life, according to many people. It has a subsurface saline ocean that could be examined by a lander that drills through the thick ice crust. The implications of finding life there would have a big effect on many people back on Earth. The good news is that JUICE is going to fly by Europa, and NASA has been directed by Congress to develop a mission to land on Europa and do it soon. They want this mission to happen. So, it looks like we’re going to get it. What do you think? Which of these missions would you be interested in? Do you have others you’d like to see? Let me know in the comments below. Maybe we can come up with some great ideas we haven’t thought of before. This is the newest series to come to I Read Encyclopedias for Fun, the weekly Top Ten. I will be publishing top ten lists of various topics scientific, geographic, and anything related to books, TV shows, and movies. They are not merely lists, however. They also include some interesting information. Some of the lists will be purely factual, while others will be my opinion. So, let’s get started. 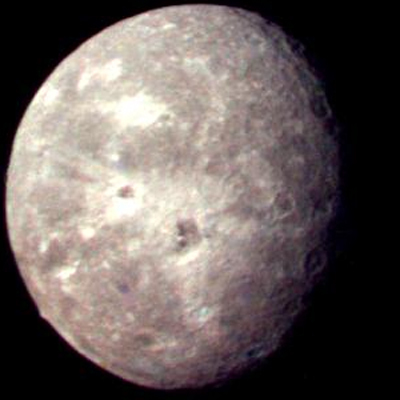 With a mean radius of 761.4 km, Uranus’ moon Oberon is the tenth largest moon in the Solar System. It has a mass of (3.014±0.075)×1021 kg , and a mean density of 1.63±0.05 g/cm³. 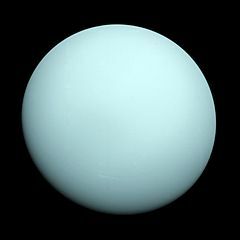 It’s the second largest moon of Uranus, and was discovered by William Herschel in 1787. It’s estimated to be about 50% water ice, and differentiated into a rocky core and icy mantle. The surface is slightly reddish and is covered with craters and chasmata. It has only been visited once, by Voyager 2, which mapped 40% of its surface. With a mean radius of 763.8 km, Rhea is the ninth largest satellite in the Solar System. It has a mass of (2.306518±0.000353)×1021 kg, and a mean density of 1.236±0.005 g/cm³. It’s the second largest moon of Saturn, and was discovered by Giovanni Domenico Cassini in 1672. Due to its low density, it’s estimated to be about 75% water ice, and only about 25% rock. It appears it has a homogeneous interior, meaning there is no core. It is heavily cratered and has only a few chasmata or fractures on the trailing hemisphere. It’s been extensively photographed and mapped by the Cassini orbiter currently at Saturn. 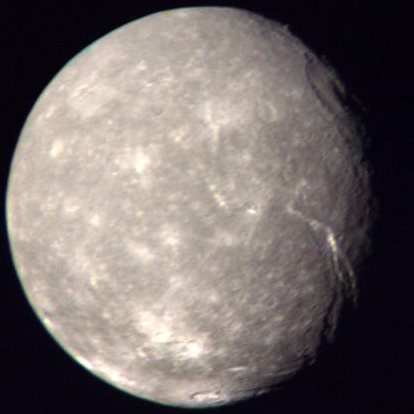 With a mean radius of 788.4±0.6 km, Titania is the eighth largest moon in the Solar System, and Uranus’ largest. It has a mass of (3.527±0.09)×1021 kg, and a mean density of 1.711±0.005 g/cm³. It was discovered by William Herschel in 1787. It’s estimated to be around 50% water ice, and may have a rocky core. 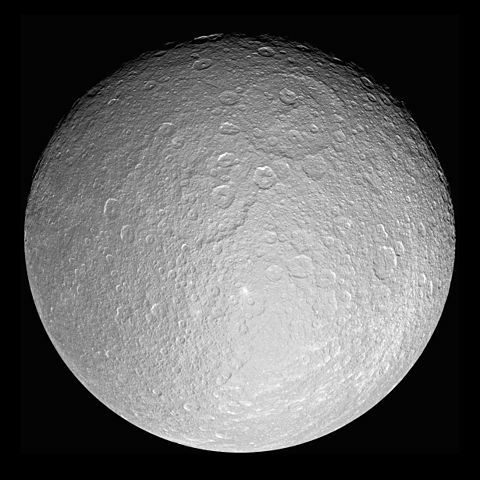 The surface is cratered fairly heavily, but not as much as other large Uranian moons, meaning it has a younger surface. It features several large chasmata and scarps, pointing towards tectonic activities in its past. It may have a tenuous carbon dioxide atmosphere. About 40% of the surface has been photographed by Voyager 2. With a mean radius of 1353.4±0.9 km, Triton is the seventh largest moon in the Solar System, and Neptune’s largest. It has a mass of 2.14×1022 kg, and a mean density of 2.061 g/cm3. it was discovered by William Lassell in 1846. Triton is unique in that it’s the only large moon that orbits its planet in a retrograde direction. Because of this, the tidal forces from Neptune will cause its orbit to degrade and crash into the planet or create a new ring system in about 3.6 billion years. 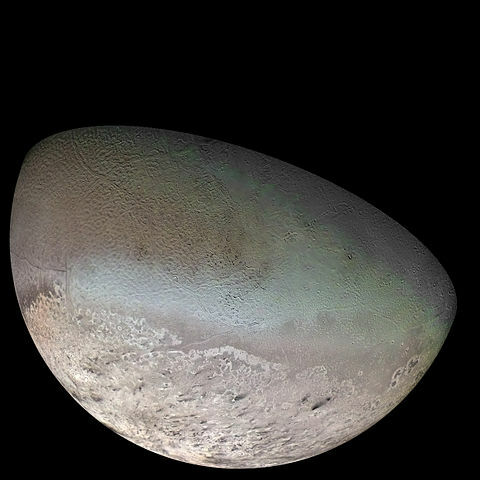 Triton is also very active geologically. It has several nitrogen geysers that have been observed to be erupting. The surface is relatively young, having been resurfaced in the past, leaving it smoother and more reflective. It’s likely to be differentiated, having a core, mantle, and crust. It’s guessed it may have a liquid water ocean beneath the surface. The core likely generates heat to help keep the water liquid. The atmosphere is a thin nitrogen atmosphere, and clouds have been observed. It’s theorised that Triton is a captured moon, likely a Kuiper Belt object. With a mean radius of 1560.8±0.5 km, Europa is the sixth largest moon, and the fourth largest of Jupiter’s Galilean satellites. It has a mass of (4.799844±0.000013)×1022 kg and a mean density of 3.013±0.005 g/cm3. It was discovered by Galileo Galilei in 1610. Europa is one of the most exciting satellites in the Solar System for one major reason, it has a large subsurface ocean of liquid water. It’s so large that it has more water than Earth. Because of tidal heating, it is quite possible that it has hydrothermal vents, which are teeming with life in Earth’s oceans. The surface is incredibly smooth and made of water ice. It has features similar to the Arctic polar ice cap and very few craters. The surface is young and constantly being resurfaced. Beneath about 10-30 km of ice, there’s a thick ocean of liquid water, around 100 km thick. And then beneath that is a rocky interior and a metallic core. One of the most prominent features is the lineae, or the extensive lines that cover the surface. These are cracks where fresh water may be coming to the surface, and plates of icy crust move against each other. With a mean radius of 1737.1 km, the Earth’s Moon is the fifth largest moon in the Solar System. Its mass is 7.342×1022 kg and mean density is 3.344 g/cm3. It’s the second densest moon in the Solar System. It’s the most familiar moon, as we can see it very easily from Earth. Its discovery is prehistoric, since we’ve always known it’s there. The surface is heavily cratered, except in the Maria, which are basins flooded with lava. There are also volcanoes, some of which are relatively young. This suggests a warmer interior than previously thought. The interior is differentiated, with distinct crust, mantle, and core. The surface is dominated by silica, alumina, lime, and iron oxide. It’s tidally locked, so we only see one side of the Moon. The far side is very different, lacking the maria we see on the near side. It’s also the only moon that has been landed on by humans, and one of only two moons that has been landed on by robotic probes. 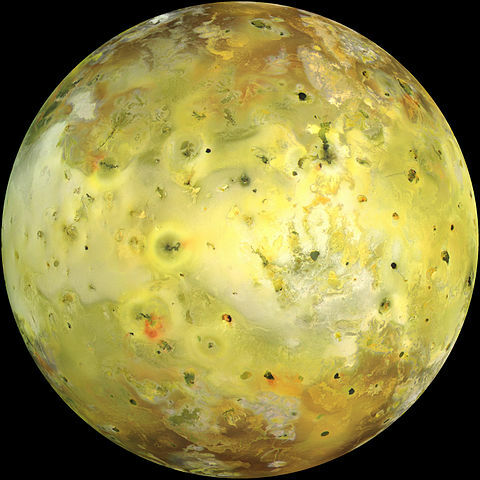 With a mean radius of 1821.6±0.5 km, Io is the fourth largest satellite, and the third largest of Jupiter’s Galilean satellites. It has a mass of (8.931938±0.000018)×1022 kg and a mean density of 3.528±0.006 g/cm3. It is the most dense natural satellite in the solar system, and is also the most geologically active. It has more than 400 active volcanoes, which makes it the most active object in the Solar System, more than Earth. It was discovered by Galileo Galilei in 1610. When Io was first viewed up close, it was a surprise. The surface is a very colourful mixture of red, orange, yellow, white, and black. Several volcanoes can be erupting at the same time, and lava lakes have been observed. The surface composition is mostly silicates, sulfur, and sulfur dioxide. Due to tidal interactions with Jupiter, the interior is constantly being flexed. With an internal structure more similar to terrestrial planets than other moons, it has almost no water ice. It has a crust, mantle, and hot core. With a mean radius of 2410.3±1.5 km, we’re moving into the top three, and the true heavyweights of the Solar System’s moons. It’s the third largest in the Solar System, and the second largest of Jupiter’s moons. It has a mass of (1.075938±0.000137)×1023 kg and a mean density of 1.8344±0.0034 g/cm3. With a relatively low density, it is about half ice and half rock. It was discovered by Galileo Galilei in 1610. The outermost Galilean satellite, it has far less tidal influence from Jupiter, and therefore has an old, relatively inactive surface. It is covered by craters, and is considered the oldest surface in the Solar System. 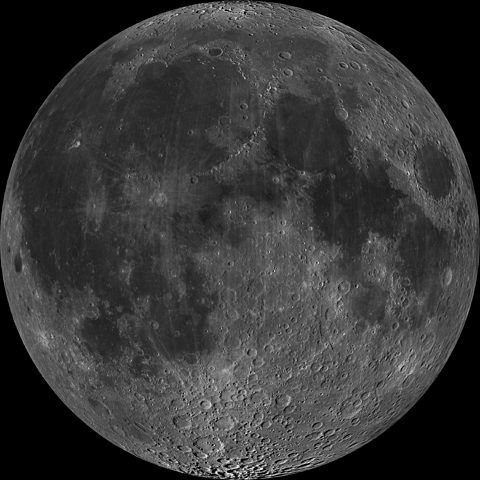 Unlike other large moons, it’s not very differentiated, and is mostly a mixture of rock and ice covered by a possible liquid water ocean and an icy crust. It has a thin carbon dioxide atmosphere. 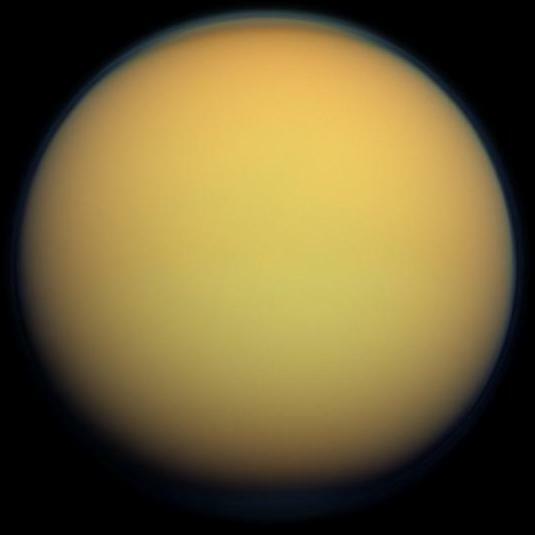 With a mean radius of 2575.5±2.0 km, Titan is the second largest moon in the Solar System, and Saturn’s largest. It’s even larger than Mercury, but has a smaller mass. It has a mass of (1.3452±0.0002)×1023 kg and a mean density of 1.8798±0.0044 g/cm3. It was discovered by Christiaan Huygens in 1655. It is the only satellite outside the Earth-Moon system that has been landed on by a space probe, the Huygens lander. It has a very thick atmosphere, thicker than Earth’s and with a 45% higher air pressure at the surface than Earth’s. The composition is mostly nitrogen with some methane and hydrogen. 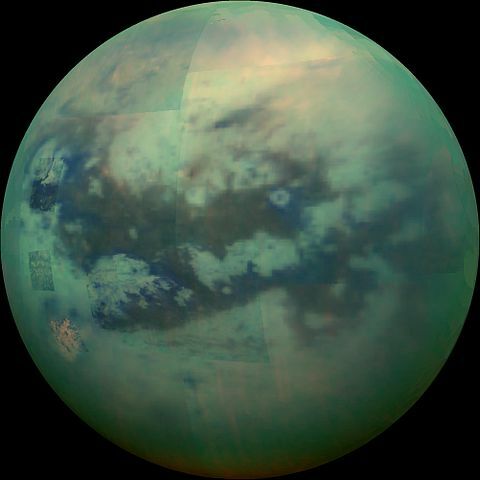 What makes Titan incredibly interesting is the surface. It is very Earth-like, with mountains, rivers, and lakes. However, the lakes are not water, but liquid hydrocarbons, mainly ethane and methane. There are some craters, but the surface appears to be quite young, with possible cryovolcanism. Basically, the surface is like Earth’s but ice replaces rock and hydrocarbons replace water. It’s a differentiated body with a silicate core, an ice layer, then a possible liquid water ocean, and the ice crust. With a mean radius of 2634.1±0.3 km, Ganymede is the largest moon in the Solar System, and Jupiter’s largest. It has a mass of 1.4819×1023 kg and a mean density of 1.936 g/cm3. It was discovered by Galileo Galilei in 1610. The surface is quite complex with older cratered regions and a younger grooved terrain. It’s mainly water ice with some carbon dioxide and sulfur dioxide. Some salts hint at a salty ocean beneath the surface. It’s fully differentiated with a hot iron-nickel core and silicate mantle. It’s believed there’s a thick liquid water ocean between two layers of ice. There’s an extremely tenuous oxygen atmosphere. Ganymede has its own magnetic field, and has even been observed to have aurorae. This also helps strengthen the theory that there’s a salty ocean. Tidal stresses from Jupiter aid in heating the interior, which makes Ganymede another possible candidate for life. If you have any questions about these or any other moons of the Solar System, I’ll do my best to answer them. As this was one of my biggest interests in university, I’ve been paying attention to news related to the Solar System and its moons. Ask your questions or leave comments in the comments section below. When I say soon, I mean tonight! Although it will be Wednesday my time when I post it, it’ll be Tuesday in most if the world. 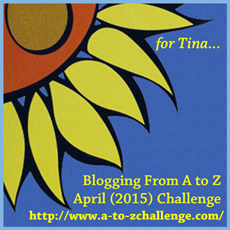 I am starting a weekly Top Ten series that will focus on science and geography. Sometimes they’ll be factual, other times, they’ll be my opinion. But I will always provide you with some interesting information about each entry. And I intend it to be full of pictures. Interested? Let me know what you think.